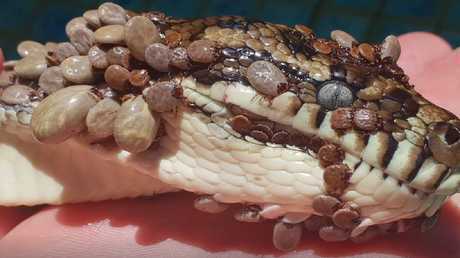 A snake catcher has shared footage of the horrifying moment he located a carpet python riddled with more than 500 ticks in Queensland. Gold Coast and Brisbane Snake Catcher worker Tony Harrison shared his terrifying experience on the local business's Facebook page on Thursday. He claimed he was called out to a property in Coolangatta, 100km south of Brisbane, after a homeowner spotted a snake in their swimming pool. 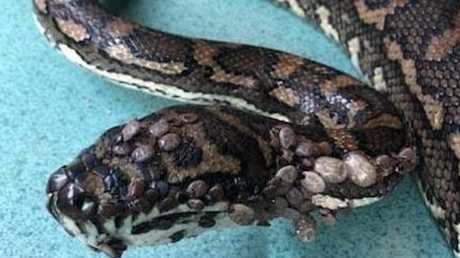 When they got closer to the reptile, they saw it was covered in hundreds of deadly paralysis ticks. When Mr Harrison arrived on the scene, the experienced snake catcher began streaming the visit live on Facebook and was disturbed at what he found. "Look at the ticks on him. Jesus Christ," Mr Harrison exclaimed on the video. "I've never seen anything like this. I've done this for 26 years and this is the worst I've ever seen." It is thought that in a desperate bid to save itself, the python appeared to have entered the swimming pool to try to drown the parasites. 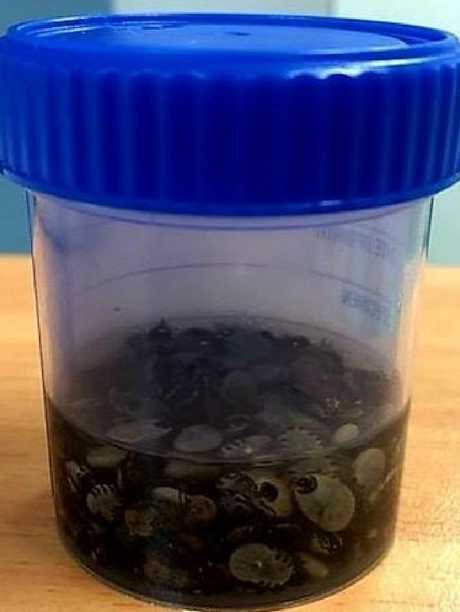 It took vets at Currumbin Wildlife Hospital hours to remove hundreds of nasty paralysis ticks from the reptile. Picture: Gold Coast and Brisbane Snake Catcher. During the video, Mr Harrison tried to make sense of what he was seeing. "What happens is in Mother Nature, animals can live in harmony with parasites both internal and external," he said. "If something happens to them the parasites get the better of them. "He's got hundreds of paralysis ticks on him. That's why he's in the water, he's trying to drown them." Mr Harrison said reptiles have a higher tolerance to the poisonous ticks than mammals and humans. 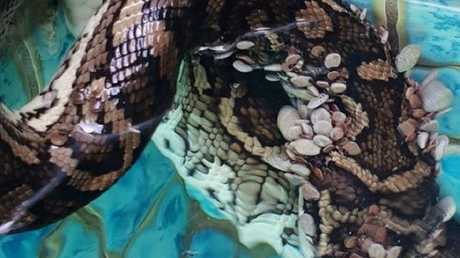 The python, now called Nike, was removed from the pool and taken to the Currumbin Wildlife Hospital for treatment. 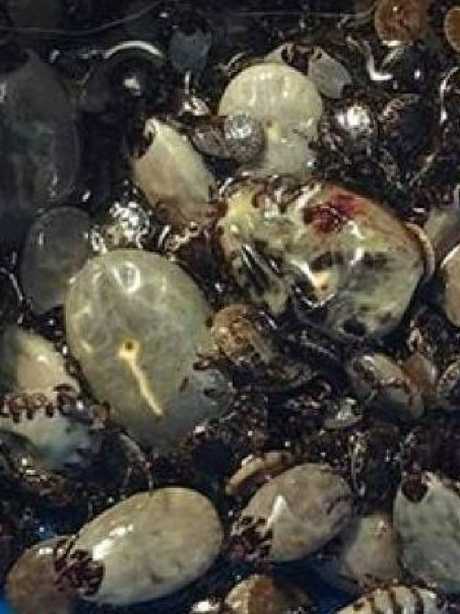 It took many hours for vets to remove the 511 ticks from the animal's body. But despite the agonising procedure, Nike still hasn't been given a clean bill of health. 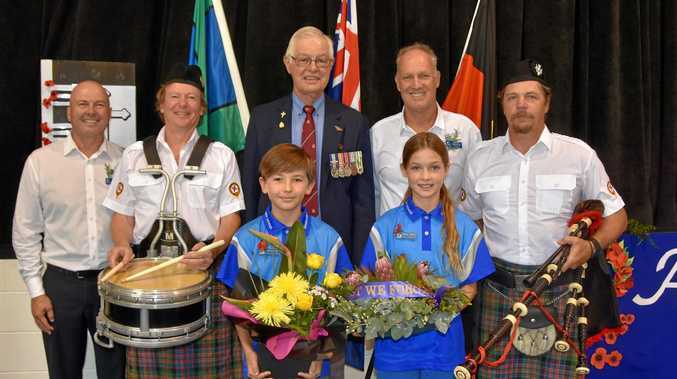 "There are still tiny young ones under the scales that will be treated with drugs to kill them," Mr Harrison said. A Currumbin Wildlife Hospital spokeswoman told the ABC that Nike was still in their care. "We're running tests, trying to find out what's wrong with him," the spokeswoman said. This is the second time in less than a month that a snake has been covered in something strange. Earlier this month a snake was found covered in cane toads, as they hitched a ride to safety following floods in Western Australia.